"Hard pressed on my right. My center is yielding. Impossible to maneuver. 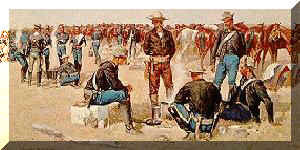 This is an UNOFFICIAL web page and is designed to entertain and educate the viewer on U. S. Cavalry traditions and history. None of the information provided is classified!